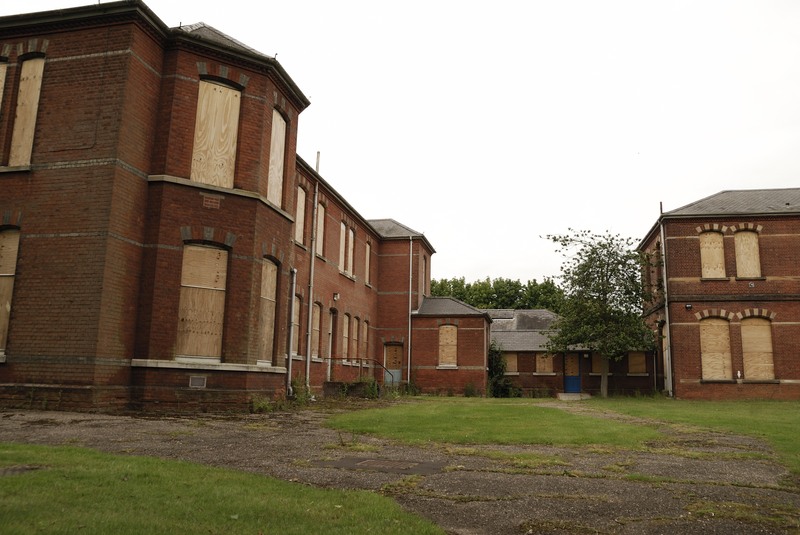 St. Andrews Asylum is also known as the Norfolk Lunatic Asylum Annexe. Its a vast complex arrangement of traditional H shaped buildings all linked with a straight trunk corridor. Its rumoured that St. Andrews is only one of two original asylums that has a curved corridor. The main Norfolk County Asylum has been refurbished into luxury housing. Since the move of the Norfolk Primary Care Trust, St. Andrews has been for sale for either conversion into offices or flats. The length of time that St. Andrews has been left shows. Inside, there is moderate damage to roofing and flooring, its looks to be a direct result from copper/metal thefts. This building has had approximately half refurbishment in the last twenty years, the other half is representative of the more original decoration, mainly due to asbestos risks in a significant proportion of build. 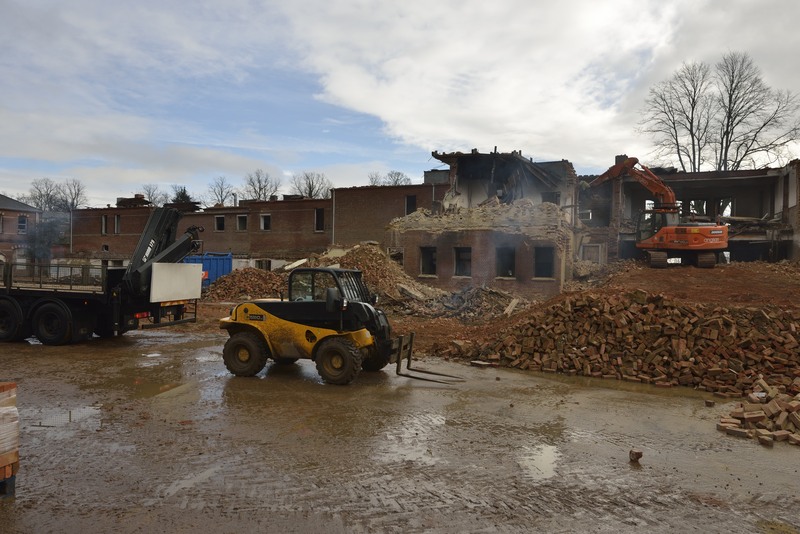 In April, 2012 the building and land has been acquired for conversion into offices and asbestos removal has started in preparation for further work. Plans for St. Andrews annexe, a separate auxiliary asylum several hundred yards to the north of the main buildings on the site of cricket field, were announced in 1876. The buildings were to be of ‘somewhat plain, simple and comparatively cheap construction’, later described as ‘a sort of go-between the Asylum and the Workhouse’. Designed by the architects Cornish and Gaymer, they were modelled on Metropolitan Asylums Board institutions at Leavesden and Caterham. They comprised a two-storey ‘H’ shape with large and rather barn-like male and female wards linked, or rather separated, by an administrative cross-section, behind which lay a single storey complex of kitchens and staff rooms. Costing £33,920, they accommodated 250 patients, two and a half times the original capacity. ‘Chronic lunatics, imbeciles and idiots’ were placed under the care of Hills’ assistant, who became resident medical officer, a head female attendant and a relatively modest staff of attendants and nurses. Problems created by the ‘furiously and dangerously mad’ were recognised by the ‘Vagrancy Acts’ of 1714 and 1744, which allowed justices of the peace to order their detention. 18th-century law held such persons responsible for any criminal acts, and prisons or bridewells (houses of correction) were the main destinations for their secure accommodation. 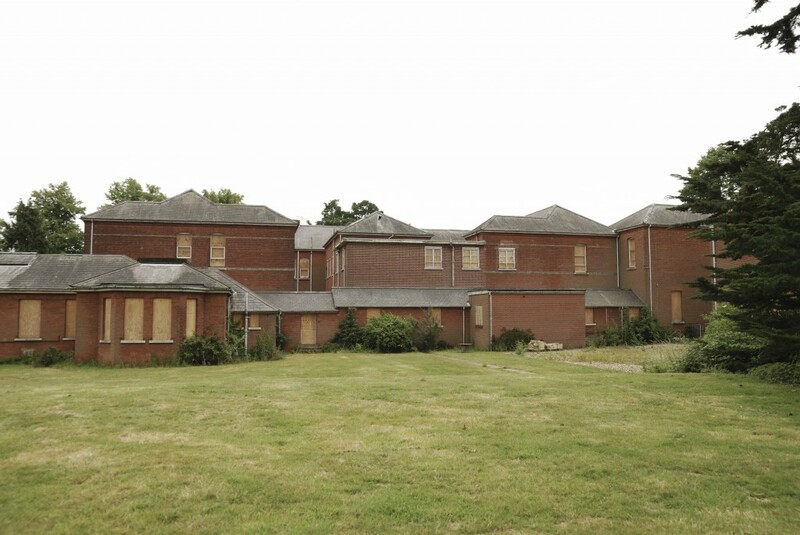 Philanthropic efforts had already produced some care homes but the 1808 ‘Act for the better Care and Maintenance of Lunatics, being Paupers or Criminals in England‘ resulted in the construction of a number of large asylums ranging in capacity from 40 to 3,500 inmates. County Asylums were placed throughout the Country, usually (but not always) within the County they served and sites deemed suitable would commonly be large isolated tracts of land, often served by minor roads and branch railways, the qualities of such sites providing the ideal curative sources for good light, fresh clean air and a nice views across farmland and woodland. Locally they provided a sustainable source of employment for generations and developed their own communities to serve them. Further afield they were often viewed with suspicion or fear – a distant place where disturbed local people or relatives would be ‘removed’ to, and often surrounded with much folklore. On 11th October 1808 it was resolved by the Norfolk Quarter Sessions that the next General Quarter Sessions of the Peace “take into consideration the expediency and propriety of providing a [County] Lunatic Asylum…” following provisions contained in An Act for the Better Care and Maintenance of Lunatics being Paupers or Criminals in England, 48 Geo. III c.96 (1808). Magistrates were requested to obtain and transmit to the Clerk of the Peace a list of all the lunatics and other insane persons in the county and in July 1809 a committee was appointed “for the purpose of making inquiry into the number of idiots and lunatic paupers…”. The committee reported that there were 153 lunatics in the county and it was resolved to defer the consideration of “the expediency and propriety of providing a lunatic asylum”. In October 1810 consideration for the provision of an asylum was resumed and a committee of nine was appointed “to make enquiry and to consider the best means for building, erecting and managing” such an asylum. The committee reported that the asylum “should be erected as near the City of Norwich as can be so as to be within the County…” and that the County Surveyor had prepared a plan for an asylum capable of receiving 180 lunatics which could be enlarged to hold 300. The estimated cost of the institution was £20,000. In April 1811 the Visiting Justices (as the Committee had been renamed) were able to report the purchase of five acres of freehold land at Thorpe at a cost of £600 and in October of that year they had taken possession of the site and that they were “exerting themselves to keep down the expense of the building by open contract for every branch of the work and by avoiding every species of ornament…”. 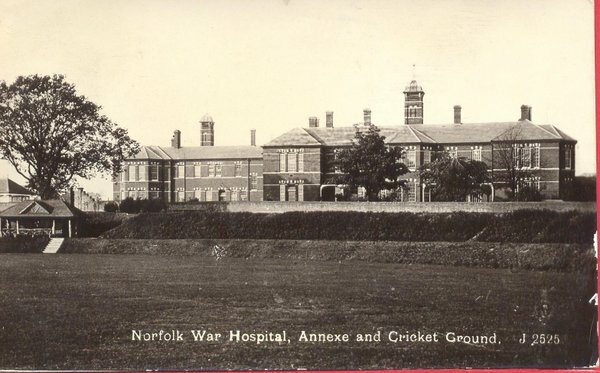 The Norfolk Lunatic Asylum was situated on Yarmouth Road, Thorpe St Andrew near Norwich. The architects were Francis Stone and John Brown (Norfolk County Surveyors) and Robinson Cornish and Gaymer of North Walsham. The County Asylum was intended specifically for pauper lunatics and was only the second institution of its kind when completed in early 1814. The buildings were originally designed for the reception of 40 male patients in April 1814, followed by female patients in June of the same year. Roughly 70 patients were present on average in the early years. Extensions in 1831 and 1840 allowed this number to double and more substantial additions in the late 1850s as well as the construction of an auxiliary asylum, which was completed in 1881, some 700 inpatients could be accommodated. The auxiliary asylum or annexe is situated to the north of the main buildings, on the other side of Yarmouth Road, connected by a lane that was carried over the main road by a bridge. In April 1889 the institution was re-titled the Norfolk County Asylum, and after its modernisation into ‘a hospital for mental disorders’ (with reorganisation into distinct male and female asylums) there was room for more than 1,000 patients. Patient care was disrupted by the outbreak of WWI, with most of the patients being evacuated to other institutions across eastern England. The subsequent development of the County Asylum to the beginning of the present century is given briefly in Thomson, D. G. The Norfolk County Asylum, 1814-1903, 1903 (SAH 323). During World War 1 the hospital was used by the military authorities as a War Hospital. Details of this period in the hospital’s history are to be found in the Annual Reports, 1915-1920. The Asylum became known as the Norfolk Mental Hospital in 1920 and the name was again changed to its present title, St. Andrew’s Hospital, in 1923. In the period between the two wars the hospital housed more than 1,100 patients. 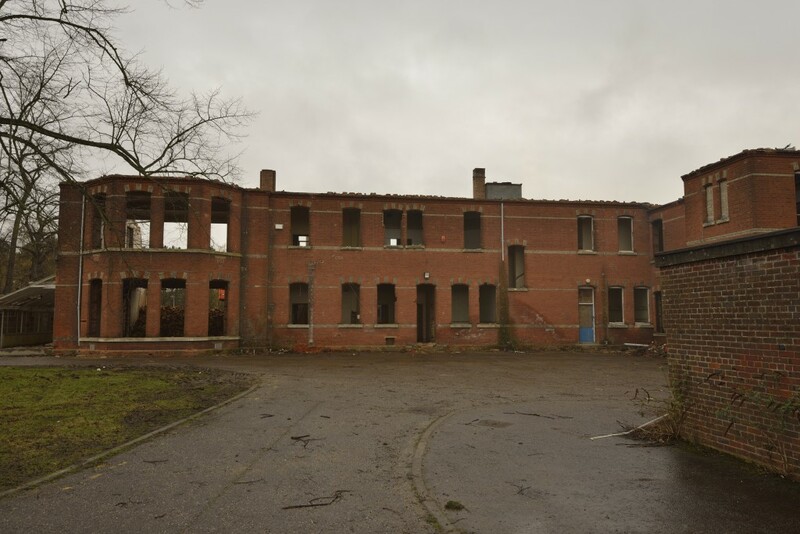 During WWII the hospital was used as a multi-purpose hospital, providing the additional functions of an Emergency Section hospital such as receiving refugees, evacuees and civilian casualties in cleared wards whilst maintaining its complement of mental patients. 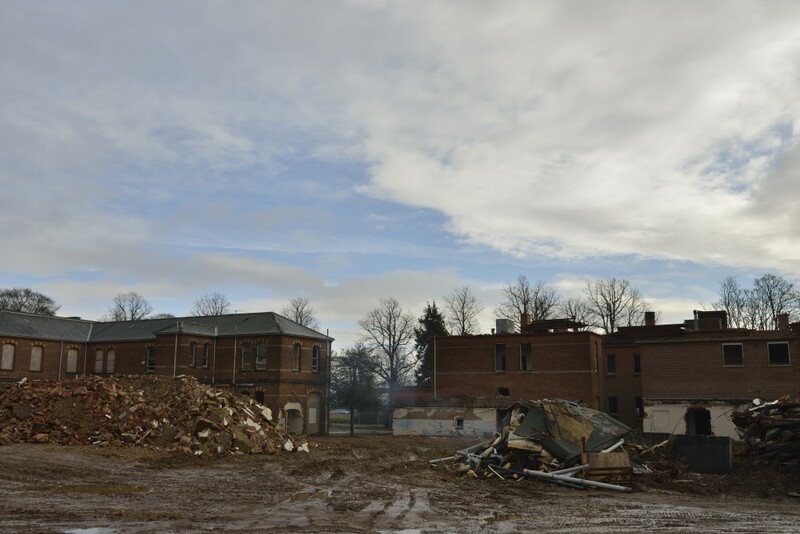 Building work commenced early in 1812 and in October 1813 the Visiting Justices were able to report that the asylum would be ready for the reception of patients at Christmas, however it was not until April 1814 that the asylum was ready to receive 40 male patients. By July the asylum was ready for female patients and in October rules and orders for the regulation and good government of the asylum were prepared. In 1815 the Visiting Justices declared the final cost of constructing the asylum to be £35,221. 2s. 7d. Following the National Health Service Act of 1946 the hospital passed from the county to central government control and became administered by the East Anglian Region, Group 7 Hospital Management Committee. From the 1950s onwards – with improved therapies and new medications, the changing perceptions of patients’ rights, and increasingly critical assessment of the psychiatric hospital as as an appropriate setting. Control passed to the Norfolk Area Health Authority in 1974 following the National Health Service Re-organisation Act of 1973. 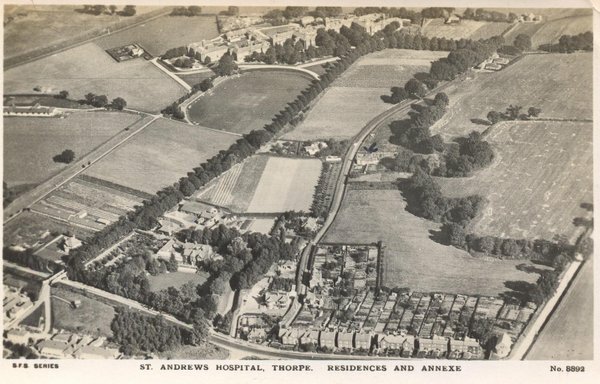 St Andrew‘s spent most of its years as an NHS hospital under threat of closure, a long drawn-out process that was ultimately resolved with the securing in 1994 of a separate NHS Trust for mental health care services in Norfolk. The hospital was eventually closed in April 1998. The original grade II listed hospital buildings from 1814, situated to the south of Yarmouth Road, have since been converted into private housing. The complex incorporates a church (in Francis Stone Court), also converted for domestic use. There is no trace of the nearby cemetery which was presumably built over when the hospital became disused (it is still marked on OS maps). 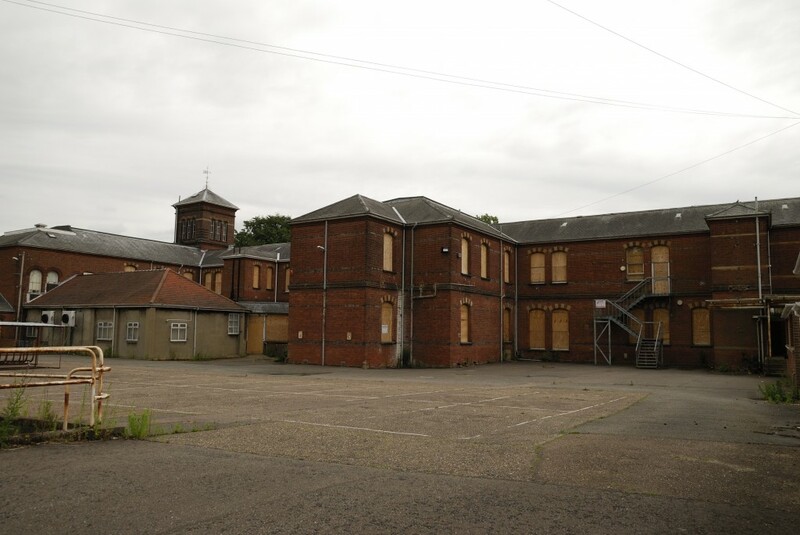 In January 2011 the auxiliary asylum – St Andrew’s House and its 13-acre site – situated north of Yarmouth Road, on the edge of St Andrew’s Business Park that has sprung up around it, has been put on the market by NHS Norfolk, touted as a prime site for development. It was most recently used as offices by the Norfolk Primary Care Trust, now NHS Norfolk, which left in 2007 for more modern premises. 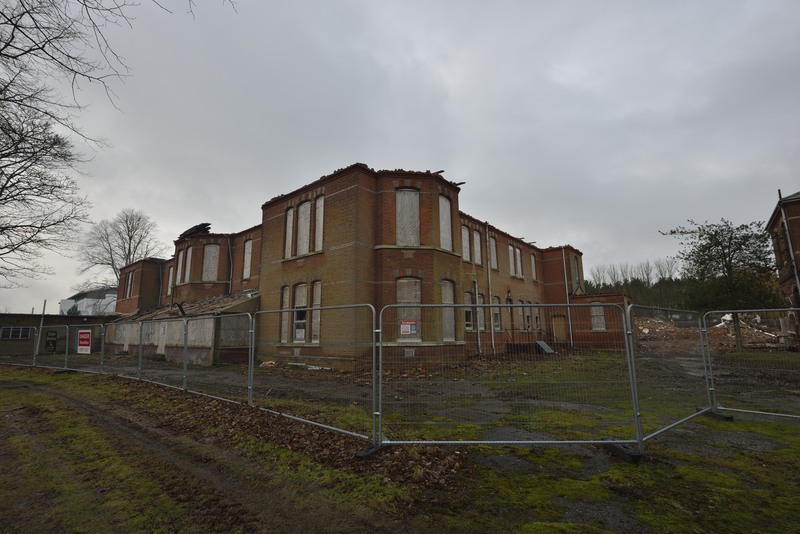 Following long talks, in Q1 2012, the site is rumoured to have been purchased by Norfolk’s Graham Dacre and in March 2012, asbestos removal teams have started to remove/check for contamination. 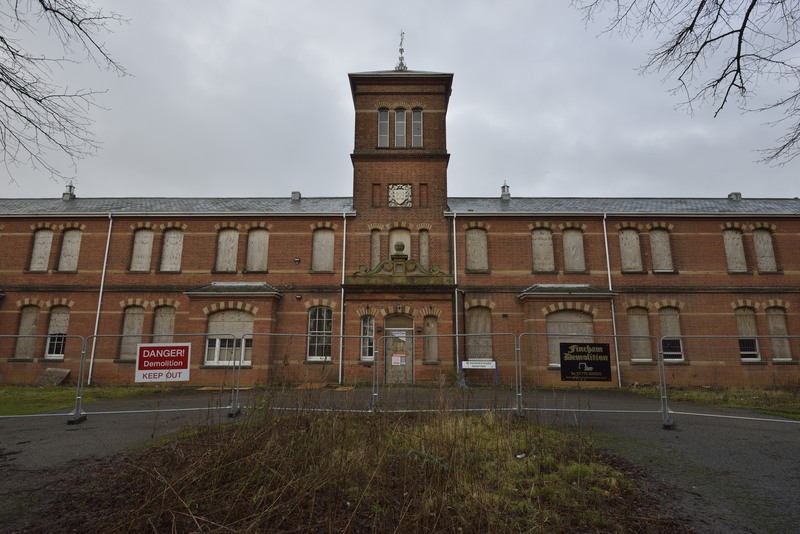 Whilst cheap construction, St. Andrews Asylum is a dominating and large complex situated in a beautiful location. Its a shame to see its deterioration over the last 5 years, theft and vandalism has been significant despite security and police intervention. In 2011, a security guard acted to stop a fire deliberately started in an act of vandalism. Whilst talking to a previous employee, there are features to this building that are not in current plans such as the link tunnel that runs under Northside road connecting the annexe to the former Norfolk County Asylum, this is not documented and has not been found. 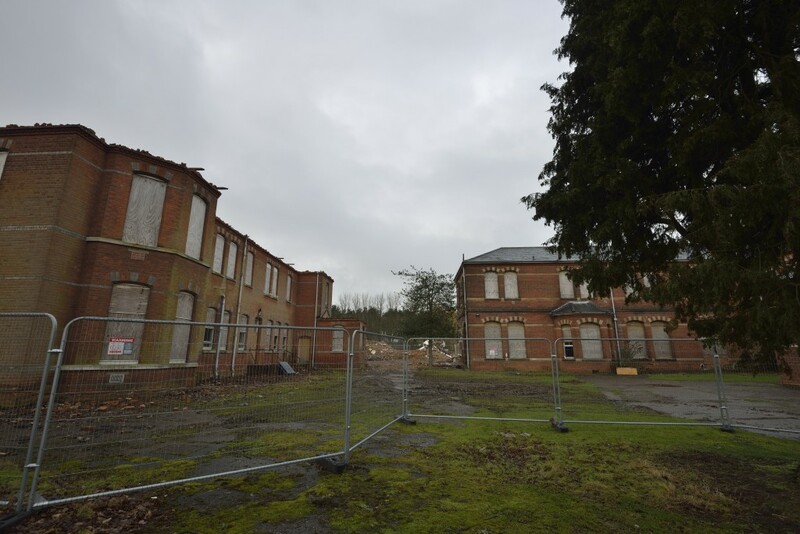 Dave – I wonder whether you might give a talk on this ‘Lunatic Asylum’ to the Norfolk Historic Buildings Group in our Winter Programme 2013-14. I find your article most interesting and I’m sure it would be of interest to our members. Might you link it to the several other mental hospitals which surround Norwich? I’ve been away from Norwich for a couple of months and am very sad to see that St Andrew’s is now being demolished. If you’re not in the business of giving talks, I quite understand, but maybe you could suggest someone who might give us a lecture instead. Thanks for the contact – I shall send you an email in reply. I wonder whether you’ve tried contacting my email address – I haven’t heard from you yet. I see Dr Steve Cherry of UEA lectures on St Andrew’s, but I think his interest is more in social history, and I was hoping you might tell us something of the architectural history as well! Let me know . . .
We have some wonderful Infrared photographs of this building and would love to have performed a Paranormal Investigation there, but never gained permission. In one photograph we believe we may have captured an apparition. Hi John lewin, myself and our team would love to do a paranormal investigation to at St Andrews and wondered if you had any luck investigating there . I’ve taken some pics of the outside of the building and believe I have captured an apparition. I see you may have captured some to. Latest information on transition to a business park. Good news is they are keeping the water tower and surrounding buildings. ….. and the bad news is that they intend to convert the historic cricket pitch, until 1987 home to one of the oldest teams in Norfolk, into a giant car park. Sir Arthur Conyan Doyle played there many times. The pitch and the pavilion could have been saved but the NHS did not want to spend the money and the developers want a car park. I have objected, I hope others will too! Thanks for leaving a comment about the history of the cricket pitch. A very interesting and informative history – thank you. You will be interested to know that the cemetery is still there, on Memorial Way in the adjacent Broadland Business Park, set incongruously among warehouses. The original graves were unmarked. Later, many Polish servicemen were buried there, their graves marked by iron crosses. In 1968, the Hospital Board decided to sell the iron crosses for scrap. An amazing decision! The cemetery was later rededicated in (I think) 1987, and a memorial stone and the outlined shapes of the graves are all that remains. It is a haunting spot, and well worth a visit. I doubt the existence of a tunnel, as a bridge over the busy Yarmouth Rd links the north and south sides of the old asylum. Moreover, the distance between the buildings is not less than 500 yards, and probably more – a tunnel would need to be very deep, as the North Side is at the top of a fairly steep gradient. Lastly, the Health Authority which used to occupy the North Side used to field a cricket team, for which I played on several occasions, right up until 2000, after which neglect of the outfield rendered it unsuitable for cricket. I never knew that the cricket ground had such significant history.. Thanks for the contribution on the history. I was unaware of the cemetery and will certainly find it and get some photos. I think the actions taken in history provide some interesting learning. here back in the late 70’s. So sad to think of it becoming a car park! I also remember the little graveyard up on Green Lane, I am glad it is still there, though hidden and un-loved. Even then there were no headstones, just stone markers for some of the burials. I remember a couple of Polish residents even then, who still spoke only Polish. So sad to see this old building flattened. My parents have considerable knowledge of the hospital having worked there from 1950 to 1998. For example the low wall around A Court on the North Side goes deep into the ground – the inner side was 12 feet high with a gap (moat) from the wall of 6-8 feet so patients could not escape. This wall used to enclose the whole of the North Side buildings but excluded the mortuary which is the single story building closest to the Secure Unit that has not been touched by the demolition works. I can remember the piggeries, orchards and other farm buildings. Dad says these housed the stables for the horses, their tumbles and swill carts; sheep were brought into graze the root crops on the fields if all where not used in the kitchens. There were green houses for tomatoes and cucumbers and other salad stuff. The cattle sheds on Yarmouth Road near the railway bridge for the livestock. All this made the hospital self sufficient. I would be grateful if you could let me know where I can purchase copies of the old photos you have inserted above, especially the aerial photo of a large area of the North Side? I currently work for the Norfolk and Suffolk Foundation Trust and used to work at Meadowlands, the current name for the converted nurses home that used to stand in the grounds of St Andrews Hospital (South Side). I have been contacted by a member of the public concerning an address she has discovered on the death certificate of a relative of hers, which I suspect may have been the old St Andrews Hospital. I said I would try and find out some information for her and wonder if you or your parent might be able to help. The significant date is 1985 and I am trying to check the actual postal address for the hospital. Any help you can give would be most welcome and maybe I can put everyone in touch with each other directly, although I must admit I am now curious myself. I was just wondering if your parents knew of Fred Meadows? He worked there at the same time. My grandmother was patient there until she died in 1985 is there any chance they would now her. I will give her name on contact. Hope someone can help. Hi Valerie, I have just found out that my great Aunt was a patient at St Andrews until her death in 1971. Can you please tell me where the graveyard is so I may visit. I came to England at the end of November 1957/58, ( I cannot remember exactly which year) to work as an assistant nurse from Spain. I wanted to learn English and as I could not afford to pay for my studies, this job allowed me to earn some money and to learn English. I had many happy days there. The patients helped me with my home-work. i.e. the days of the week, the time. and much vocabulary. At first it consisted of bed-pan, blanket, counterpane, pillow, pillow case, etc. In Christmas we had a show. I danced Spanish dance with my castañetas for them . I will always be grateful and remember those old days . My great grandfather Charles Waterson worked at the Norfolk County Asylum in the 1890s and 1900s as a musician/attendant – he played clarinet in the asylum band. I’d love to hear from anyone who has any information/pictures etc relating to the band. I worked as a male nurse for 30 years at this hospital and can confirm there was a large tunnel running under the driveway containing pipes and cables. My husband worked at St Andrews in the early 60’s . We lived in a staff house provided by the hospital and our address was 1 Green Lane. There was a row of these houses. There were also more staff houses on the main Yarmouth road just around the corner from where Green Lane joined it in those days. Along the side of our house was a lane leading down to the hospital. On the other side of the lane ,across from our house was the graveyard which has been mentioned. It was a quiet overgrown spot with oak trees growing along the side . Mention has been made of the livestock kept at the hospital. I remember one day the pigs escaped and came into our garden. It was a lovely place to live and I was sad to leave and even sadder now when I realise it has all been swept away. My grandfather was head male nurse for over 30yrs and they lived in the tied cottage in Yarmouth road next to the chapel. My mum also use to play in the grounds Of the hospital. and did meet some of the patients. Sadly there where one or to that had been institionalised and had come over from the plums ted hospital. One particular person my grandad fought in court to get him released. Thorpe parish council has a newspaper cutting of the staff and other various info on Thorpe St. Andrews hospital ,which was donated by a local lady. I lived in the row in the 1960’s and knew Billy Attwell as a Charge Nurse on G wd. Reg Doggert next door neighbour. My grandad was deputy male nurse at St Andrews. My dad worked there for 30 years ending up as the recreation and entertainments officer. (Trevor Pull) Both my sister and i became mental health nurses and also worked there. My auntie and uncle lived up green lane and we used to play around the hospital as children. I remember the old graveyard and the piggeries. I worked for the Health Authority during the 1990s and much of the hospital was converted to useable space – offices, meeting rooms. Mine was in the chaplin’s office in the small group of rooms that made up the mortuary. It was said the mortuary was placed on the part of the building that got least sun and can qualify that sun was short, the windows above head height and probably therefore the coldest part of the building. one door led to an understairs cupboard with stairs leading off the main corridor forming its ceiling. It smelt of formaldehyde and many spoke of eerie feelings and shadows moving when the building was quiet/or when they worked late. One trainee doctor who had cause to help me get something from this our store, lept back saying that he couldn’t enter the room becuase of the smell and was filled with horror at what may have taken place years ago in that room. One door led to a brick descenting staircase down to a type of cellar where it was said had been restraints on the walls. many doors led to such places beneath the building. i’d like to think they were for stores of coal, straw etc rather than people. The building had long corridors, many back stairs, lots of small rooms, high ceilings, victorian alcoves, original hand build cupboards and extra-wide victoria doors to rooms. The main corridor had low alcoves that had been plasted over – remnants of where coal fires were lit to warm the building’s core. In parts that were not converted down small corridors or offshoots could be found communal patient bathrooms which were cold and forebidding places. The building was tardis like in that through a door would be a corridor with another door that led to another corridor and yet more doors. everything connected to everything else but it was a wonderful example of architecture. In the main reception shortly before NHS Norfolk vacated hung a picture of the front of the building that had hung in the main corridor for years. wonder where that went to. For me, happy memories of lovely people from NHS Norfolk, good times working in the NHS, many fun social events including the cricket team, football team, even an eclipse where most of the building staff stood in awe on the cricket pitch. Wherever you went in the building though its history prevailed and even though it was painted and carpeted in a modern way you were never far from a relic of its history – the architecture, a door leading to an un-modernised part, the very long central corridor that ran the length of the building, original door handles, sash windows, and in unused parts the smell of urine and incarceration never left. A wonderful building and as many have said, holds great memories of a lovely place. Do you know where the records of inmates can be found please? I worked at the hospital when it was no longer a hospital but being used by the PCT. It must have been around 1999. I remember the PCT had refurbished bits of it to make it feel like an office, with green carpet and the walls painted magnolia (I seem to remember the Chief Exec had his or her office right near the main entrance in the nicest part of the building!) I remember that other parts of the building were left untouched with long empty corridors and flaking paint. I remember the curved corridor in your photo. This building made quite an impression on me and I later went on to work for a mental health charity for 8 years. I am glad you have taken the photos, it is important public record. Would you mind if I showed them to a group of midwives in a presentation I am doing on the evolution of mental health policy? 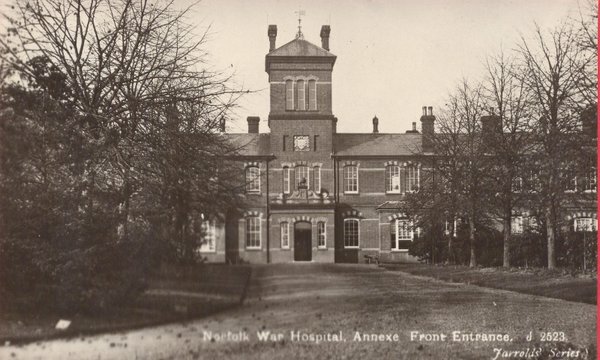 We are running a project at Norfolk Record Office about life in St Andrews Hospital in the 1880s. Here is the website: http://www.changeminds.org.uk. Could we put up a link to your site? Do you have any more photographs we could post on the site? I have enjoyed reading people’s memory’s of the hospital . I lived at 1 Norfolk cottages , Yarmouth road . I lived there from 1936 till 1954. My parents lived there till 1964. The cottages where for the staff of St. Andrews. I can remember the battle day family who lived next door. My first school was the village school at post wick which is now a house. I later went to Thorpe school . Going back to the hospital ,I can remeber the fate’s and sports days the had on the cricket field . There was a fitness instructor who had a very interesting past,( of which he had a book published )called I killed to live. . He was a local man from rack health. He was captured by the Germans in the Channel Islands and later ended up in the hands of the Russians. I got a copy from Amazon . oh wow.just read this.I too lived at 1 norfolk cottages from 1963 to 1968 with my aunt Who was a ward sister at the hospital,gwendoline Pugh and my grandmother.I too went to thorpe st.andrews school up pound lane.I lived next to the chappel and can remember people attending services there.we had a male patient who did a bit of gardening for 2shillings “baccy” money.I was told to stay indoors whilst he was working.. I worked as a registrar psychiatrist at st andrews from 1969 to 1972.and then i moed to New castle ,I lived at 9 green lane thorpe good memories there were pheasants in the back garden and farmers used to shhot pigeons.I was very interested to learn about the history of st andrews. thanks. My great grand father Corneby Austin died here in 1887. Burnt on Saturday buldozed on Sunday, so sad to see this building go so fast. Terrible waste of history, upsetting. you’re making reference to Little plumstead hospital and this is about St Andrews which is in Thorpe St Andrew and not LP. 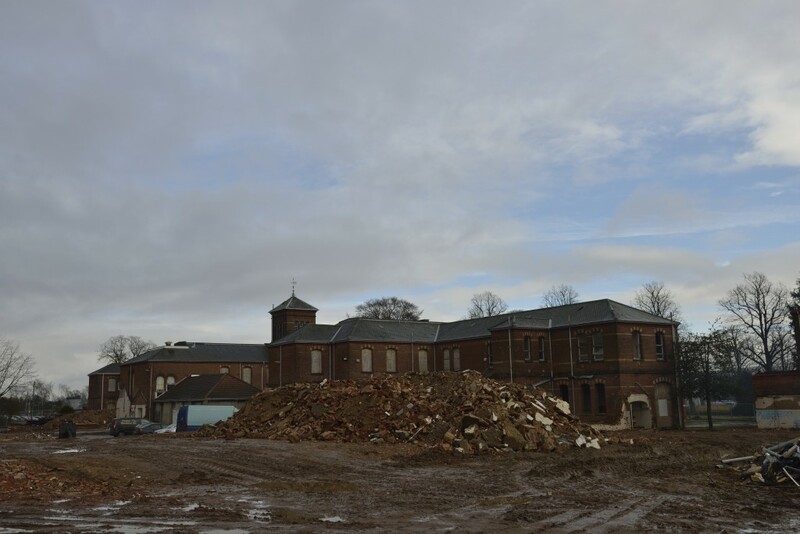 St Andrews is being redeveloped but has not been bulldozed quite yet! Certain wards were haunted, ward 11, I think was one of the notorious wards, my Mum and her friends worked nights there from the 70’s through the 80’s, They used to tell us all sorts of stories!!!! A shadowy woman had been seen on many occasions, walking the corridors, chandelier moving, noises and doors creaking. We as kids in the 70’s/80’s used to play in the surrounding area! Cricket grounds, and behind the hospital,(the lane that lead to the boat yard) we got freaked out on a few occasions! It was a spooky place, I remember a few harmless residents that were aloud to wander freely! Big John was my most memorable he was huge, and pleasant to speak to, but about 7’4″ and hands like shovels. There were some very ill people in there, and my mum always told us about the residents they lost during the night, sometimes it sounded like a release, and how they went peacefully or not. I suppose we had a certain respect for the hospital and the life’s and deaths the walls had seen. But the spooky stories I will never forget, I am 45 now and I it’s sad to hear it’s been demolished, I hope the houses/flats that stand in the place of ward 11 are peaceful! I certainly would not have gone into the wards on my own then or now, if it was still standing. Thanks for sharing your experiences. The multiple times we were shooting this location we had some interesting experiences however once the demolition started, the entire building felt different. I personally do not believe in hauntings/ghosts etc however even I have to admit, the experiences we had in here are unexplained and we have some amazing stories. This is so cool! My 3rd great grandfathers, father in law was a patient at the ‘lunatic asylum’ in 1941. Would be great if i could access his records. Did you ever receive the plans for the buildings? Indeed I am in the process of recreating the building in 3d ( Free as part of the Change Minds project) from some watercolour plans from around 1820, scans of the proper plans would be terrific. The drawings im working from are not ideal and alot of guesswork will be involved. Regardless, do you have any more images available here or elsewhere as for reference work they are invaluable. Whatever the case, great site and great images. I can confirm there was a service tunnel that connected the two buildings that ran from the front entrance and across Thorpe road and up the hill. this contained heating pipes and cables. I did some insulation work there in the early 1970s. part of the tunnel was flooded at its lowest part below Thorpe road i expect it’s still there . Interesting article and picture. I’m currently writing my dissertation on NLA. The history is so interesting. We have cartoons drawn by our grand father or patients, doctors and others who played sports at the asylum. We also have a rather anodyne account of his time there as a male nurse. I have set up a secret group site where all these things can be seen and some other links. I am very interested in every to do with place as it helps us to understand our grandfather. If you would like to get back to me I will ask my sister if its OK to include ouy on this groups site. I wonder if someone could guide me into finding out about my Grand Father who more or less spent his life as an inmate here . He was surrounded in mystery and things that didn’t add up .I met him on one occasion in the 50s when he was allowed out for a wedding .He also died there and was buried in the grounds in what I was told was a paupers grave . I would dearly love to know the reasons why he lived his life here . Patricia, I wish I had information to help you but unfortunately I don’t. Instead I am interested in any reply you might get about where patients were buried. My great- uncle was also an inmate from sometime soon after the end of WW1 until his death there in 1952. Again, mystery surrounds the circumstances but I was told by one family member that although he was a patient there for some time he chose to stay on there as a gardener. I have only recently found out that he lived and died there. I hope you get to unravel the mystery of your grandfather. This is all fascinating. My grandfather both worked there for 30 years as a male nurse, leaving in about 1950 I think. He has left us cartoons which he drew of the many cricket matches which took place on the cricket field, I think it was staff and in mates who took part. They played many other institutions around Norfolk. There are many named characters , dates and fixture details as part of the cartoons. They are funny charactures of people all based around the cricket games. (Some football ones also). Some cartoons are a little more to do with what the treatment was, so are perhaps not such fun, but nevertheless are drawn with a comedic approach. My sister and I would love the cartoons to be used or archived or seen by ancestors of staff or inmates. There was a magazine produced 1915 or so giving updates and articles on life and times in the hospital. Some cartoons are featured in there. Please can someone get in touch so we can move forward with this idea and share this memorabilia. .How nice to come back to Memory Lane. The Beauty of the Norfolk Country Side! Coming on duty (as an Assistant Nurse). My name was then María Jesús Fernández. But soon the English called me Maria! I did not mind… it was easier for them. I thank God for HIS generosity bringing me to this beautiful country. England from Spain. and it is now the most important part of my life! I have been working on the site of the current secure unit today, and decided to look up information about the old hospital on line. It was really interesting reading and nice to have small insights into the past from comments made at the end. A colleague that I was working with today confirmed that the tunnel is under the roadway and that he had walked through it whilst working at the hospital before it closed. The pipework referred to by others were heating pipes. Apparently the heating was done on the lower site and piped up to the upper site (called district heating). Tragic to see the state of what remains of what was started 200 years ago. Anyone remember Harriet Mayes, Do not know actual dates but guess 1930-1960s? Where are patient records kept now? They are all at the Norfolk Record Office. Some of them may have been duplicated of which they would be available from the Norfolk Heritage Centre at The Forum, Norwich. I visited the place last night. Looking at it gave me the creep’s, but loved every minute of the journey. I was a student nurse in the 90’s and did placements in the day hospital and ward 3, which was extremely spooky , especially at nights, also the secure unit at the Norvic clinic. The history which surrounds St Andrews is important and shouldn’t be forgotten, somewhere in amongst my training notes I’ve old books ( hand written ) about the history which I was given during my placement there. Thanks for the comment. If you ever find the books, would it be possible to photocopy or send some images of the hand written history? Would be a great addition to the history. 1971. Having been a farm labourer in a country town prior to enlisting in the Great War, I am sure he would have been overawed by the architecture of this building whilst staying there as a patient. I’m reaching out to anyone who used to work at the hospital, or might know anything about the Polish servicemen and women buried at the cemetery on Memorial Way. The site is virtually unknown to the Polish community in Norwich. As far as I know, no one visits the graves, or commemorates the fallen in any way (unlike at the military quarter of the Earlham Cemetery). In the long run, I’d like to get in touch with the Polish embassy to hopefully dedicate / commemorate the place somehow. For this to happen, I need more info about the site, and Internet research is unfortunately turning up limited information. Any help will be much appreciated! according to an entry in the parish register My great great grandfather Amos Jackson died in the “Thorpe Lunatic Asylum “ on 19 Aug 1868 Aged 50. I would love to know more about him admittance, why, etc but the Norfolk Registry Office charge two arms and three legs for this service it’s such a shame these records are over 145 years old now and should be made public. I don’t know what else to enter other than name and E- Mail???? Went to the site on a very rare visit to Norwich in September 2016. Not much remaining – a shame in some ways but fascinating too, and most interesting to my wife who had never been before. I was a path lab ‘junior’ in 1969/70 and left as the lab closed when the work was transferred (to the N&N hospital if memory serves). I have some very good memories of that time, and can rather facetiously say that I learnt more in 6 months there than in my first year or more of subsequent university. The breadth of experience in that short time was hugely useful in my subsequent career in Pathology. Dear Ros, The graveyard is on a short street called Memorial Way which is off of Peachman Way. It is in an industrial area Broadlands Business park. You might be able to find the exact location of your relative at the Norfolk Record Office. Wishing you success in your search. I know this is a very long shot but I am trying to find out information on my mother who worked here as a nurse. I do not know any dates but she was born in 1917 and was a very young nurse when she worked here, possibly in her 20’s. Her name was Marguerite Church and I believe she had a friend who also worked here and was called Eunice, this lady’s surname was Cope but I do not know if this was her maiden or married name. There is a book about the hospital in the Norwich reference library. It mentions the tunnel. This book was quite old 60 years possibly more. My husband saw the tunnel (reached by the coms room by a very long corridor). An employee showed him the access to it and was able to see the tunnel clearly. My father worked as a male nurse and he spoke of the need for the tunnel for difficult patients,as an easier way of transferring them.my grandfather and great great grandfather also worked as male nurses. I have a photo of no. 3 “The Firs” Green Lane, our family home. Also one of the male Ward Room ,plus,a group gathering of new male recruits which included my grandfather and his brother, taken at the Front of the hospital. My name is Anita Macdonald née Elvin and I reside in Australia. I have been trying to obtain any information regarding my grandmother Mildred Ellen Elvin née Moy and also my great grandmother Sarah Moy also called Fanny who were patients at the “st Andrews Lunatic Asylum”. My Grandmother died there in 1920 and my Greatgrandmother was still at the Asylum at that time. We are over in England at the moment and have been to Norfolk Records Office but cannot access Hospital records as they are closed till a future date. We have been directed to the memorial at the park where my Grandmother was buried. It is now just a park but was really nice to walk around it. I am anxious to try to find more information as to why my close relatives were in the Asylum as I have family in Australia who may benefit from this knowledge. Would anyone know of a Nellie Price who worked in the laundry at St Andrew Hospital around 1928 onwards, or any other worker in the laundry please? I also worked at St Andrews from 1983 to 1993 as a ward sister. My 4th Great grandmother was a patient there 1841-1851. Her name was Rhoda Legood, and she was from Norfolk. It’s sad that these days there would have been a lot more help for people than there was all those years ago. Some of the reasons could of been what we now know as Post natal depression etc, so awful that people were locked up for what we would get help for now. I was lucky to get help with someone who paid about £100 for information on Rhoda and it was really helpful and very kind that they shared what they knew. Hi I worked on Southside and Northside, A1 ward and ward 12 with Beverly cross. Lots of ghostly going ons.